Today: We talk to Jake Dell, fifth-generation owner of Katz's Delicatessen, about the recently published Katz's: Autobiography of a Delicatessen. Read on to win a copy of the book! The best kind of New York institution is relatable to people everywhere. It doesn't alienate; it brings together the otherwise separate masses. Think Woody Allen, and Frank Sinatra, and arguably the most famous deli in the world: Katz's. In a culture where culinary fads arrive and pass quickly, Katz's proves that the deli remains alive and well. It is family-run, steeped in history, standing on a menu that is impervious to trends and refuses to change. Its loyal following has everything to do with integrity and very, very little to do with that time that Meg Ryan threw her head back and made some noises. 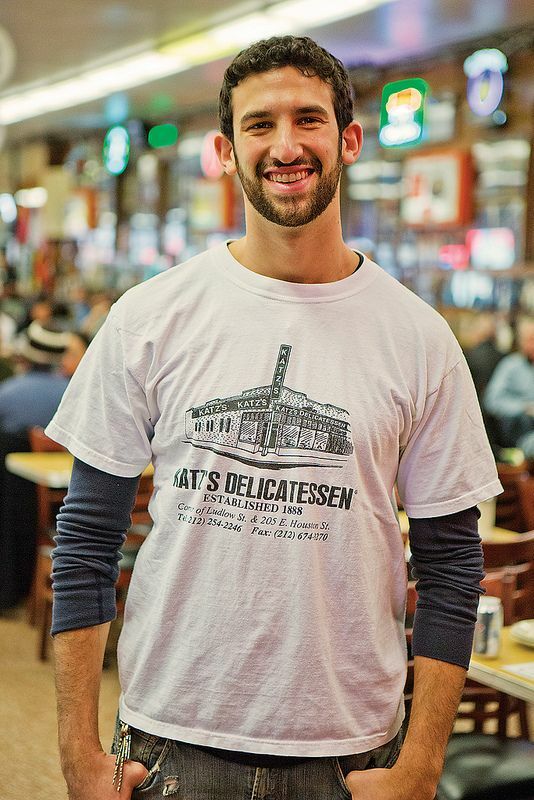 In the recently published Katz's: Autobiography of a Delicatessen, manager Jake Dell has penned the deli's history, accompanied by photographs by Baldomero Fernandez. We chatted with Jake about all things Katz's, and we're giving away three copies! Katz's has always been a family-run business. What are the most important lessons that your father, uncle, and grandfather taught you about running the deli? Growing up, I was always reminded of the value of the customer. Just like those before me, I try to meet and greet everyone who walks through our doors, and make it my mission to make sure that everyone leaves with a smile on their face. My family likes to remind me that a “Katz’s nirvana” can usually be achieved in 3 ways: food quality, nostalgia, and atmosphere. So I focus on making sure that everything we serve is of the highest quality, that we maintain the centuries-old traditions that our customers know and love, and that this wonderful deli continually remains a fun, vibrant, eccentric, and exciting place to eat. In your opinion, what's the most underrated item on the menu? I think “underrated” is the wrong word here. There are many items that are simply “under-ordered” because people usually flock to the hotdogs, matzoh balls or hot meats (pastrami, corned beef, brisket, and turkey). One of those items would probably be the latkes or blintzes. They’re perfect -- just the way grandma made them. Or maybe the chocolate babka -- it’ll seriously change your world! 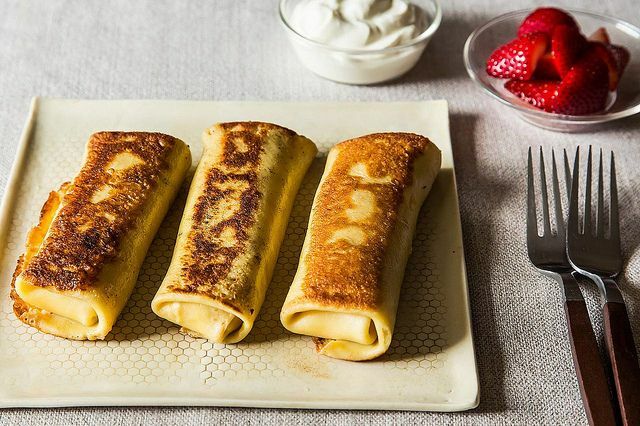 More: Watch Joan Nathan make cheese blintzes. How many people know the pastrami recipe? How secret is it? When you're not at Katz's, what do you eat? Like any good Jewish boy, I go home to eat a lot, and my mother never seems to skimp out. Sometimes I feel like she thinks I have 3 stomachs! I also think that my sister is one of the best cooks in NYC -- so that’s a great plus! If I’m not going home or cooking for myself, I’m a big burrito eater. In fact, my roommates and I had a challenge to see who could be the first to eat 50 burritos over a several month period. I won. I don’t know if that’s a good thing or not. What do you want readers to learn from this book? I want people to get a glimpse into what makes Katz’s Deli so special, to see the magic that I am lucky enough to experience every day. Baldomero, the photographer, did a wonderful job capturing every aspect of who we are. I kept the history and the stories brief, and let his pictures speak for themselves. 125 years from now, we’ll have this snapshot of the deli, and a cohesive story of what brought us to this moment. 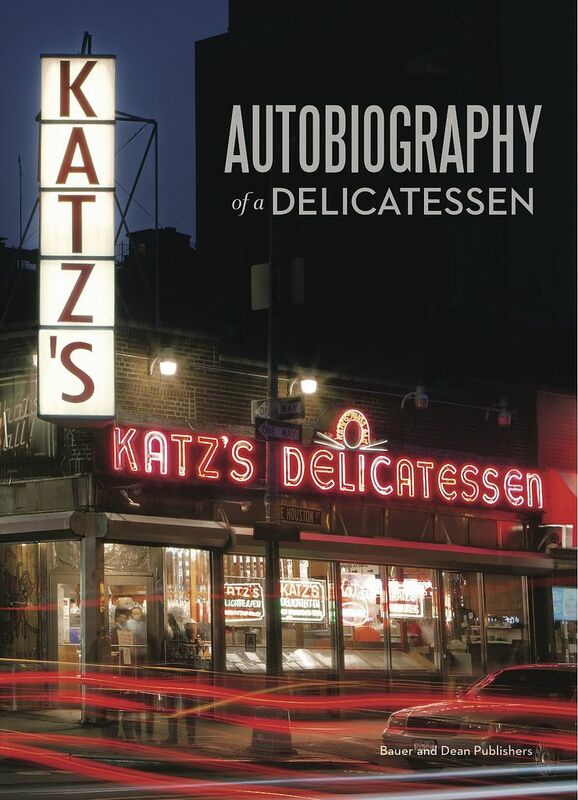 We're giving away copies of Katz's: Autobiography of a Delicatessen to five lucky readers! In the comments, tell us: what's your favorite thing to order at a deli? We'll choose five winners at random this Friday, October 4 at 3 PM EST. Sorry, but we can only ship to US-based readers. Blintz photo by James Ransom. All book photos by Baldomero Fernandez. Nobody is mentioning the kishke? Ok, then, more for me! I love Katz's kishke! And pretty much everything else as well. Please open a branch in Orlando! I love the Hot Dogs with Sauerkraut! Oh, I so miss Katz's (and Russ and Daughters)! There is nothing like an authentic New York-style deli and sadly none exist where I now live. I too am in the pastrami and rye camp (with a half-sour pickle, please), but I think that next time I am dining at Katz's, I may have to try their blintzes! 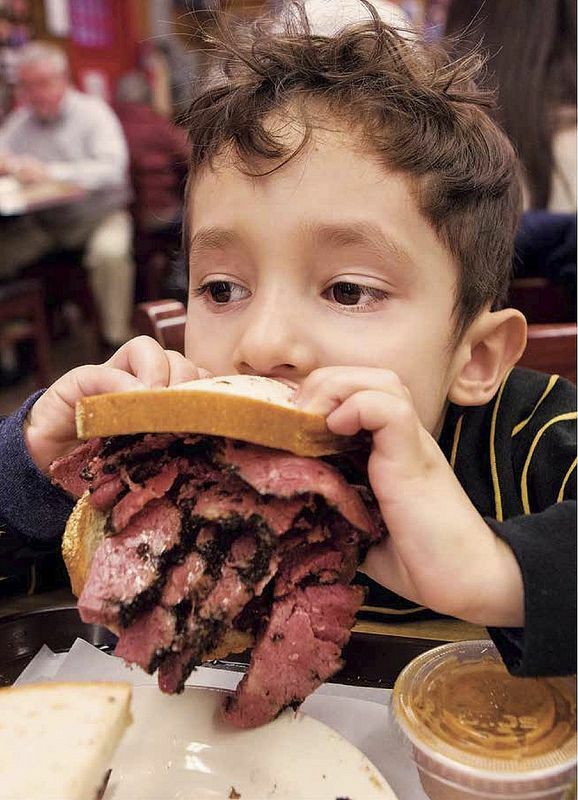 So many people are partial to the pastrami on rye. And why not? But what's wrong, I might ask, with pastrami on club, already? My favorite would have to be Katz's Pastrami in rye with mustard, Dr. Brown's cream soda, order of fries, kishke and maybe some kasha varnishkas. If I were on death row and asked what do I want for my last meal..... THIS IS IT..... oh yeah, a side of sour pickles!!!!! Pastrami on rye, half sour pickle and an order of fries!!!! Being a New Yorker married an Upstate NY native (Syracuse) loved Katz's deli make it a must stop every time we visit NYC! Pastrami on rye, with mustard (and sometimes a knish!). My favorite is the corned beef on rye with pickles on the side! Definitely the pastrami with extra pickled tomatos!!! Pastrami on rye, extra mustard. Yum! pastrami on rye - it makes my mouth water just thinking about it. The pastrami. The pastrami. The pastrami. I was a vegetarian for 6 years. Twice each year I'd wake up in the morning, turn to my boyfriend and say, I NEED A PASTRAMI SANDWICH. He'd reply I'll meet you at Katz' after work. I'd take two bites. Sigh like I'd been given a key to heaven and pass my sandwich to him. He'd eat mine and his. When I stopped being a vegetarian. A Katz' pastrami on rye with only half the meat and lots of mustard was my first stop. I didn't even bother to go to work or take my boyfriend with me. It's a little un-kosher (get it? ), but I love pastrami on a good soft kaiser roll, spicy mustard, and extra pickles on the side. Pastrami on Rye, with lots of spicy mustard.